When I was drafted, I volunteered for the Navy instead. 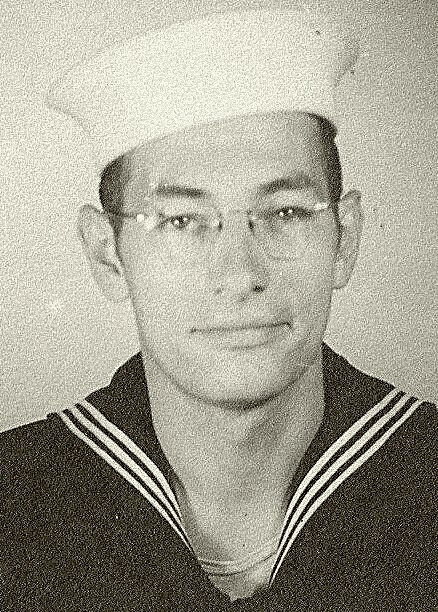 On March 9, 1945, I went into the Navy at Bainbridge, Maryland for basic training. 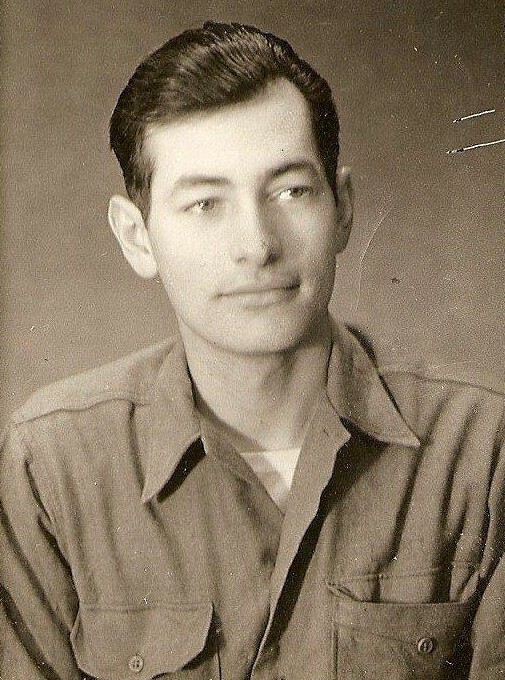 I was in Company 4096 and graduated May 9, 1945. After basic training, they gave me 10 days of leave to go home. I was then sent to San Diego, California to the Ship Repair Base. There were 15 sailors in one rail car traveling across the country. One older sailor was in charge. He would take us to the dining car to eat. We were not allowed to go into any other passenger cars. While in San Diego I was assigned to a floating dry dock. After 6 weeks, we were sent to San Bruno, California (15 miles south of San Francisco). We were taking Commando training for the planned invasion of Japan. After the beach was secure we were supposed to be part of a ship repair outfit to repair ships. Then we dropped the atomic bomb on Japan and that was the end of the war with Japan. We did odd jobs on the base until October 1945. On October 1st 1945 we went to Treasure Island. The next day we went to Oakland and were assigned to the USS War Hawk (AP-168), which carried troops and cargo. We went to San Francisco one day and then left on 6 October and took 10 days to get to Pearl Harbor. We spent 13 days there loading more equipment and troops. We stopped one day at Buckner Bay, Okinawa and unloaded mail. We were not allowed to leave the ship. When we got near China, there were so many rumors about communists fighting with the Nationalist Chinese that our officers decided to stop at Shanghai, arriving on November 8, 1945. We were there 3 days. I got to go sightseeing in town one day. When the Admiral heard about that we stopped at Shanghai instead of continuing on, he said “go where your orders tell you.” That was 900 miles north of Shanghai to Tangku at mouth of the Hai River. We got there on November 15, 1945. We were on that troup ship 45 days from the time we left San Francisco until we got to China. We set up a supply base at the mouth of the river. We were in a group called GROPAC 13 to supply the troops inland. The Japanese had invaded China 7 years before WW II. But now that the war with Japan was over, the Japanese soldiers had to go home. They were coming to the dock by train and walked aboard ships to go home. They were doing this on their own. We did not assist them in any way. We would load supplies in trains for our troops inland. We lived in brick buildings that the Japanese built with no running water or bathrooms. We put wood stoves in and later converted them to oil. We built shower rooms outside. We ate outside in field kitchens. Later we moved indoors. We only got 2 meals a day. We went out to eat a lot. One time we got to a restaurant that was closed for selling dog meat; we had eaten there the day before. At first I was in the car pool. Later I was assigned to the heavy equipment. Seven of us were heavy equipment operators and licensed to drive everything on the base. We all worked together and hauled a lot of heavy equipment to the Marine Base inland. I did a lot of lifting with cranes & bulldoze work when needed. We also did all our own maintenance work on our equipment. I made third class motor machinist mate (MoMM3c). The Navy built a water purifying plant that we operated. The Navy then hired Chinese labor to do our labor for 7 cents a day. The people would get half and the company that they worked for would get half of their pay. The weather was like Pennsylvania because we on the opposite side of the world from Pennsylvania. We were not restricted to the base and could go wherever we wanted to on liberty. Near the end they would not let us off the base without a 45 strapped on us because of the Communists. By June I had enough points to be discharged and left there on June 3rd 1946 and traveled by ship to San Diego. From there we went to Bainbridge MD via train and I was discharged June 30, 1946.